For Putin to annex eastern Ukraine as he did Crimea would be an uncharacteristically foolish move, coming from a shrewd statesman with a proper understanding of the nuances of international politics. Provoking a war with the Kiev government would have enormous economic and geopolitical costs that would make the annexation of Crimea look marginal. The international reaction to the former would dwarf that of the reaction to the latter; the NATO response could very well involve a significant general build-up of U.S. troops in Europe, the deployment of NATO troops to Western Ukraine – or at least Ukraine’s border with Poland – and to the Baltic states; not to mention economic sanctions that would actually effect the Russian economy. In essence, the West would return a containment policy. This would not be easily laughed off by Putin and his aids. Additionally, Putin would not be welcomed with the same enthusiasm in Donetsk and Kharkiv as he was in Simferopol and Sevastopol. Ukraine’s eastern regions are not nearly as pro-Russian as Crimea was. Crimea was a part of Russia from the late-18th century, when it was snatched away from the dying Ottoman Empire, to 1954, when Nikita Khrushchev made the foolish decision to give the peninsula to the Ukrainians. When Putin took Crimea back, he saw himself as righting the incompetent Khrushchev’s wrong. According to the independence vote in early March and the polls that preceded it, the Crimean people agree with Putin. On the other hand, the people of eastern Ukraine, while still (by a slim margin) majority Russian-speaking, identify as Ukrainians more than they do Russians. Opinion polls show that even the cities furthest east are opposed to a Russian invasion by no slim margin. As fractured as Ukraine is, the majority of its citizens do not want Putin’s tanks to roll into their neighborhoods – especially because the Ukrainian armed forces would actually resist. It should also be kept in mind that the separatist militia men (who, while they might have been armed by Russia, are not Russian soldiers) in the cities of the east are not officially seeking to join the Russian Federation. Those rebels’ stated goal is simply to be independent from Kiev, not to be dictated to from Moscow. By contrast, the Crimeans voted to declare independence from Ukraine and ask the Russian government to absorb them. If Putin did decide that alienating Russia from every state in the world except Iran and Kazakhstan was worth a few hundred square miles of Ukrainian land, he would still have to deal with a hostile native population that did not exist in Crimea – one that could become radical sometime in the future, as Chechnya did. The Russians have spent billions of dollars and hundreds of lives putting down Islamic Chechen rebels, and Putin is not eager to have to do the same in Russian-occupied Ukraine. The simple fact is that an invasion of Ukraine would be a massive mistake, and it would be a massive mistake coming from one of the most skilled statesman still in power. The casual observer could be forgiven for believing the shallow analysis that Putin is simply doing in Donetsk what he did in Sevastopol, and that he is planning on seizing the territory. While this scenario is not impossible, there is a much more likely one – that Putin has deliberately made the situation in eastern Ukraine resemble the situation in Crimea before his annexation as part of a clever geopolitical maneuver. 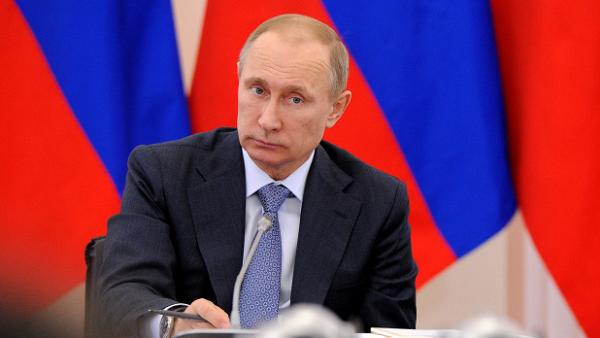 The main reason is rather simple: Putin wants to repair Russia’s damaged public image. His state’s prestige and respect on the geopolitical stage was weakened significantly by his annexation of Crimea. It hurt his relationship with his immediate neighbors, like the Baltic states, and more importantly with the other Great Powers. Though it is certainly true that Putin would rather be feared than liked, he would prefer to have both hard power and soft power at his disposal. Because the latter has been so damaged, Putin’s next step is to repair it. He will do this by showing “restraint” in the eastern Ukraine crisis. Having reached an unspecified deal with the EU, Ukraine and the U.S. on Thursday to de-escalate the situation in the major eastern cities, Putin now looks a little less brutal. He has shown that he has some respect for the territorial integrity of mainland Ukraine by not invading and annexing the territory. In doing this, Putin has taken the first step in reversing the diplomatic damage he received in March. The importance of this single deal should not be overstated, as it is going to take years of careful diplomatic maneuvering for Russia to get back to a normal state of relations with the West; but Putin has started the process. His image as a brutal, neo-Soviet tyrant trying to resurrect the Evil Empire will begin to fade and look somewhat exaggerated. This is not to say that the West’s perception of him will be reversed overnight, but the confidence in which we compare Vladimir Putin to Adolf Hitler will get lower and lower as time goes on. Being the realistic statesmen he is, Putin will not invade Ukraine. This would be imperial overstretch of the kind the Great Powers of the world are now averse to. Over the next few weeks, the crisis will de-escalate as Ukrainian security forces stabilize the country. The Russian President’s image overseas will be damaged, but not destroyed – and Russia will be on a path of restoring its place as a respected Great Power. All things considered, Russia will have exited the “most significant threat to peace since the end of the Cold War” in better shape than it was when it entered. By exercising “restraint” in Ukraine, Putin has outmaneuvered the West and improved his overseas image, all while saving face – and showing the West that Russia is not exactly the dying power it’s made out to be.